Oh, these little cupcakes are pure evil. They’re the kind that seduce you into eating more (way more) than just one. But they’re little, so that makes it okay in my book to indulge a bit. They're so devilishly delicious I just had to feature them in our "12 Days of Christmas Cookies." I know, technically not a cookie but they simply can't be missed. Their chocolate mint base is dense and delicious and filled with velvety chocolate ganache. Then, they're topped with a minty marshmallow buttercream icing that is so lip-licking’ good. These babies will melt in your mouth and disappear fast, so you may want to double the batch. 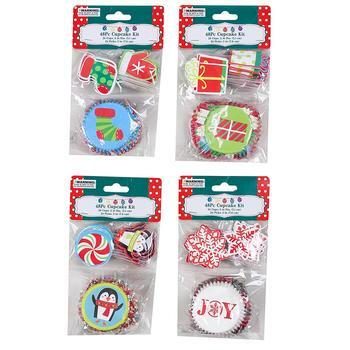 Bake them in these adorable Christmas cupcake liners with festive toppers to show off these cute little muffins (shown below). Preheat the oven to 350 degrees F. Line a cupcake or muffin pan with 24 regular-size cupcake liners. Combine the chocolate chips and hot coffee together, stirring occasionally until the chocolate is melted and the mixture is smooth. In a large bowl sift together the sugar, flour, cocoa powder, baking soda, baking powder and salt. In another bowl, beat the eggs with an electric mixer until thickened slightly. Slowly add the buttermilk, oil and vanilla. Add the melted chocolate mixture to the eggs, and combine completely. Add the sugar mixture and beat on medium speed until well combined. Fill the prepared cupcake liners three-quarters full with the cupcake batter. Place in the oven and bake until a toothpick inserted in center comes out clean, 18 to 21 minutes. Cool the cupcakes completely. While the cupcakes are baking, prepare the Chocolate Ganache and the Peppermint Marshmallow Buttercream Frosting (directions for both below). Put the frosting into a pastry bag fitted with a star tip. To make the Chocolate Ganache, bring the heavy cream and butter to a simmer in a small saucepan. Turn off the heat and add in the chocolate. Stir the mixture until smooth. Set aside to cool. To make the Peppermint Marshmallow Buttercream Frosting, whip together the butter and marshmallow cream, using an electric mixer fitted with a whisk attachment. Add the peppermint extract. Slowly add 2 cups of the powdered sugar and continue to mix on a slow speed. Add the milk and additional powdered sugar, up to 2 cups, until desired consistency is reached. Using an apple corer, remove the center of each cupcake. Fill each cupcake with a spoonful of the Chocolate Ganache. 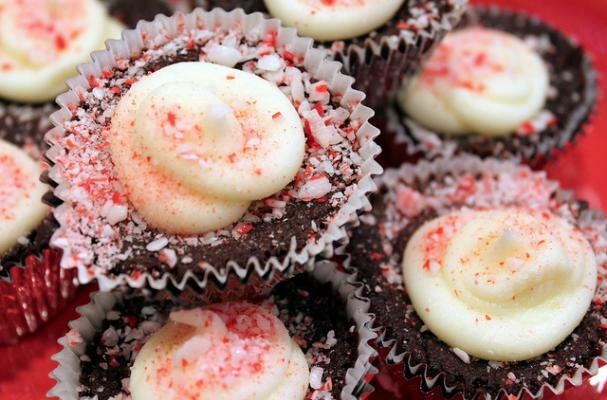 Using the frosting-filled pastry bag, frost the cupcakes and sprinkle with crushed peppermint candies.